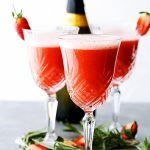 Rossini Cocktail – Festive, gorgeous, and delicious cocktail made with Prosecco and strawberry puree! Hiiii!! Clink! Clink! Ain’t that the pretties Rossini Cocktail drink you have ever seen? But, this is it, friends. We’re in the thick of it. The big day is just 3 sleeps away! Someone once said, “Not to get technical… but according to chemistry, alcohol is a solution.” YASSS! I could not agree more so it would probably be best to enjoy these next few days with a drink in hand, all while wrapping presents AND enjoying time with the family. Truth be told, that quote is what reminded me to finally share this beautiful Rossini Cocktail with you right before Christmas. Actually, I wanted to share it before Thanksgiving just in case your conversations at the table went overboard – politically or otherwise – nonetheless, it’s never too late. First, get yourself a good quality bottle of Prosecco. 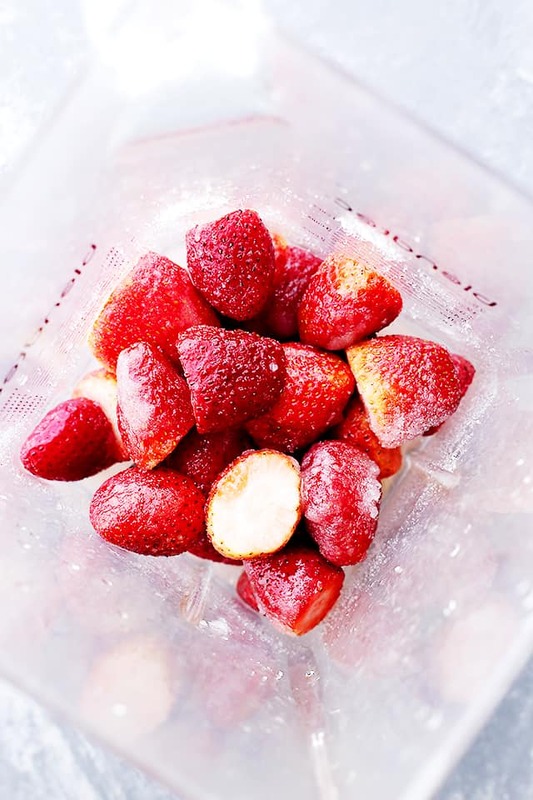 Second, combine strawberries and sugar and lemon juice in your blender and give ’em a whirl. THEN, combine all of that in a shaker with ice, stir, shake lightly, and pour. THAT is IT! Seriously, it takes minutes to make and seconds to ingest. 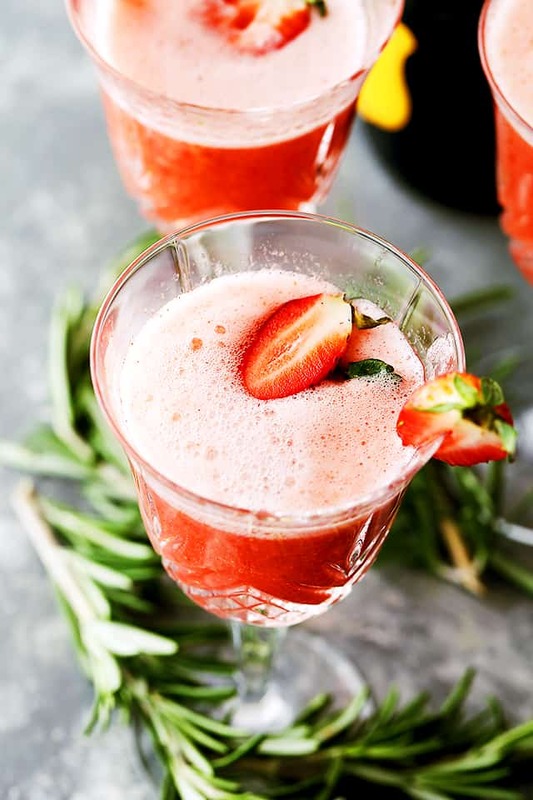 Pour it into pretty champagne glasses, decorate with strawberries and rosemary, and voila! ALSO? Don’t think too hard about your New Year’s Eve cocktail because this Rossini should be IT! 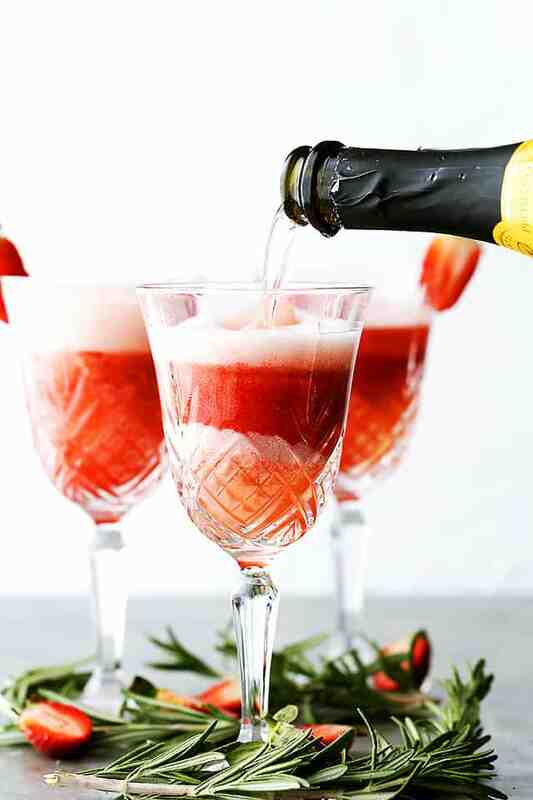 Rossini Cocktail - Festive, gorgeous, and delicious cocktail made with Prosecco and strawberry puree! Combine strawberries, sugar and lemon juice in a blender; blend until pureed and completely smooth. 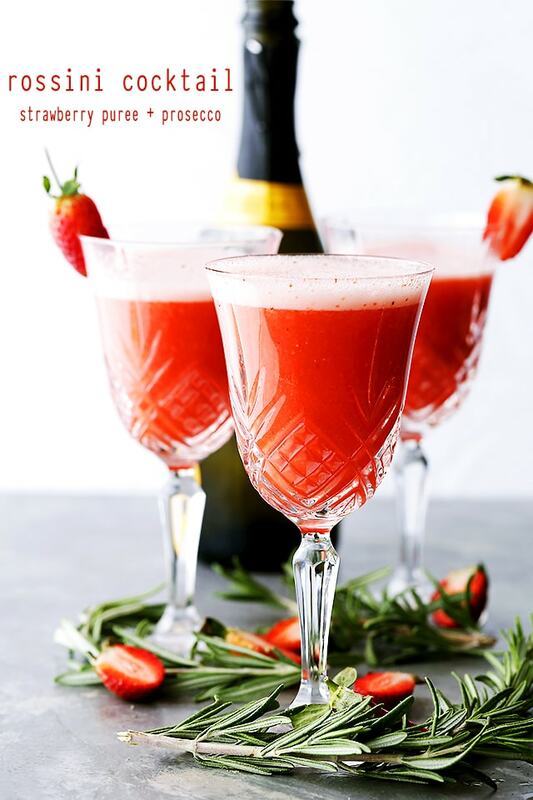 For each drink - this recipe makes SIX - pour strawberry puree and Prosecco into a shaker, fill it up with ice and shake gently. Strain into a glass and top up with a little more Prosecco. Garnish with fresh strawberries and rosemary. This is such a stunning drink and that gif is awesome! Yes please!!! I love everything about this drink! Now we’re down to only two more sleeps! (We say that in our house, too!) And what a perfect way to celebrate the holidays … sharing this gorgeous, festive drink! It’s absolutely lovely, and so simple, too – and with that lovely red color, it really just screams “holiday celebration”! Plus … strawberries! That’ll lift anyone’s spirits in the middle of winter! Merry, merry Christmas! These look delicious, great idea! Oh man, this is one gorgeous drink! I was working on a prosecco drink recipe today and as I was taste testing it at 9:30am when it suddenly struck me just how cool our jobs are 🙂 This is a lovely Christmas or NYE cocktail. Happy Holidays, Kate!